It happened that last night I was at dinner at the house of Luciano Pavarotti sitting next to the mayor of Modena and the head of the city’s chamber of commerce. Pavarotti’s digs, in the countryside outside Modena where he died in 2007, provided the setting and his personal cook Cesare manned the kitchen. Modena is located in the heart of Emilia-Romagna, one of Italy’s 20 regions and by most accounts is among the top 3 when it comes to food (not sure I agree), and Il Maestro loved to eat so only the biggest risk takers would have bet against us getting anything less than a memorable meal. And those risk takers would have lost miserably, maybe not as big as those who bet on the U.S. housing bubble never bursting, but miserably nevertheless. Pavarotti’s wife still lives in the house, though she wasn’t there last night, and keeps it as a shrine to her late husband. 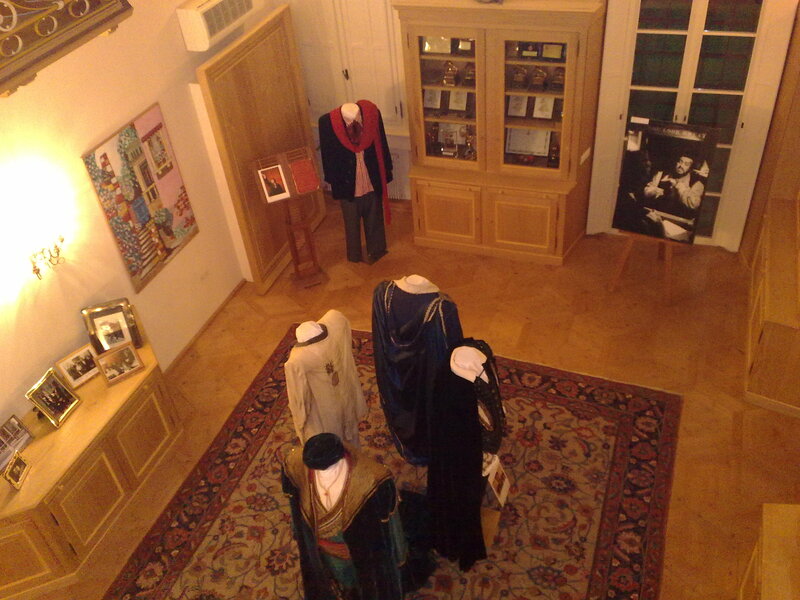 Costumes from his great performances can be found on the three floors as can his many naïf paintings, photos of him with everybody who was anybody in the past four decades, and letters from foreign dignitaries. Not long after having taken my seat, and just as the mayor was telling with great pride how he had convinced a local bank to put up 3 million euros to redo a part of Modena’s stunning cathedral, the prosciutto and other sliced, cured meats started arriving. The gnocco fritto followed close behind. This is a sort of fried bread not that dissimilar to the pittule I ate a few weeks back in Puglia only bigger and with more air inside. A hot piece of gnocco fritto wrapped in a slice of lardo, yes lard, that melts and fuses with the gnocco is a thing to behold. Smooth, creamy, slightly salty and addictive. A mild summer engulfed Northern Italy until about mid-August when the heat arrived evidently with plans to make up for lost time. We are still waiting for a break in the temperature, which might be coming in the next few days, but in the meantime we sat there in Pavarotti’s dining room sweating in stifling 90+ heat and though the windows were flung wide open that did little to help. I had come without a jacket so I could not take part in the standoff between the mayor and Mr. Chamber of Commerce to see who would be the last to succumb and strip down to the shirt. 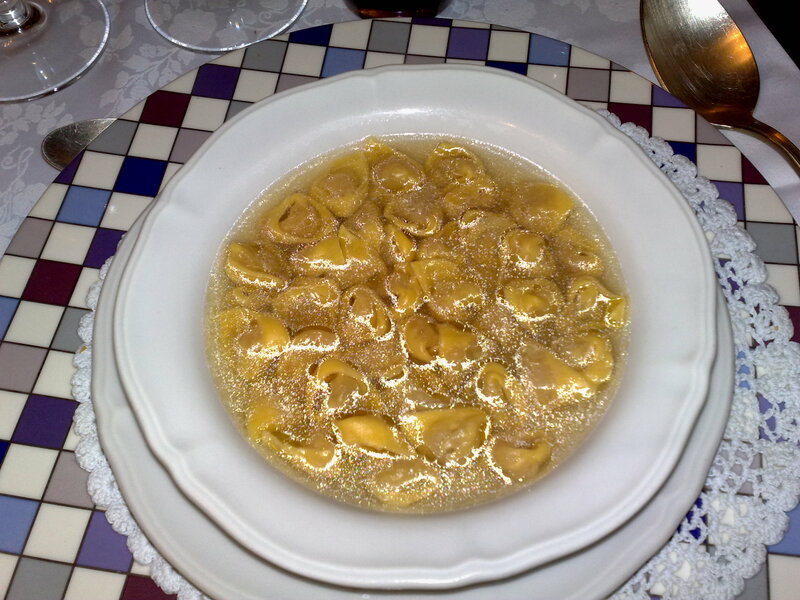 Neither could keep the jacket on once we had started on the tortellini in brodo, small ribbon pasta filled with meat and floating in a rich meat broth. Though this is the primo par excellence for this part of Italy, as I sat there mopping sweat off my brow I had to question the choice of menu. I continued to question all the way through my second helping of tortellini, which, I have to say were undercooked, but nice nevertheless thanks to the phenomenal broth. I’ve never understood how the Bedouins in North Africa can drink hot tea in the desert heat and to that list of wonders I will now add the Modenesi who eat tortellini in brodo during a September heat wave. I had planned to say no to the second primo piatto though when I saw the risotto sprinkled with balsamic vinegar, one of Modena’s dearest native sons, I changed my mind. Good move, as was my decision to accept a second helping of the tagliata, sliced beef steak. This was right about when the mayor began to explain how Italy’s new austerity budget was going to ruin his city. 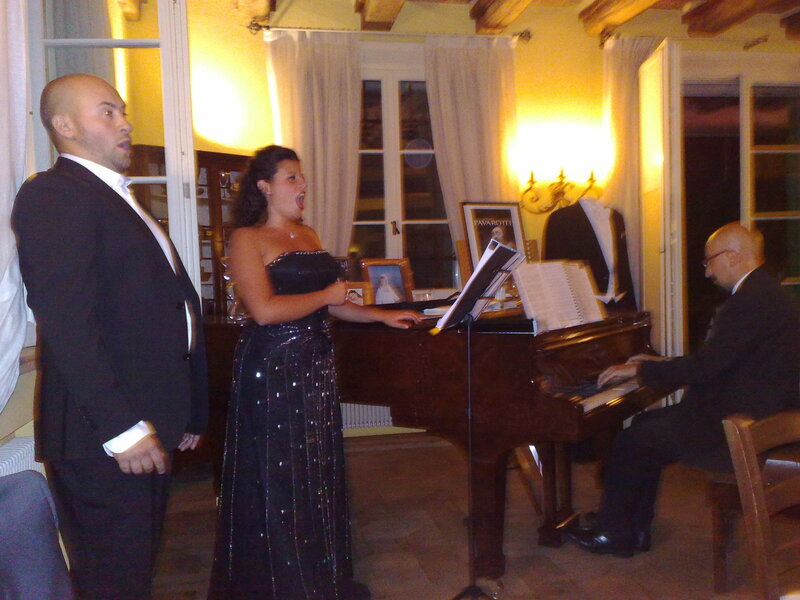 A great meal became terrific when a tenor and soprano magically appeared next to the piano near our table and took turns singing arias. This was, after all, Pavarotti’s house and the foundation that bears his name promotes young opera singers. I’d tend to disagree with the statement that gnocco fritto has anything to do with pittule but I don’t exactly know why. Pittule are full while gnocco fritto is empty but why that is I couldn’t say. They both have yeast in the dough and they both grow before being deep-fried … boh? You might be right, they perhaps seem on first look to be closer than they really are. there is the fact that they are both fried dough, but maybe that’s not enough to make them similar. I’ll investigate why the pittule remain denser while the gnocco fritto has a really thin outer shell and then is empty on the inside. I’d tend to disagree with the settemant that gnocco fritto has anything to do with pittule but I don’t exactly know why. Pittule are full while gnocco fritto is empty but why that is I couldn’t say. They both have yeast in the dough and they both grow before being deep-fried boh? Putting the lie to the fact that all Italians north of the Po just subsist year-round on polenta, a certain Rovigotta I know attests that her grandmother’s weekly cooking of massive amounts of chicken broth from scratch has left her with enduring memories of the smell of marrow. They’re not all pleasant — it’s hard for me to get her to eat the ossobuco I was happy to learn to make in Milan. All along the Adigetto, from Badia out the Delta, tortellini in brodo are eaten as a primo, rain or shine, torrid afa or bone-chilling fog, all year round. No exceptions. You don’t like it? Get thee to Padua and dine on bigoli. @valentina: The gnocco fritto is empty so it can be stuffed full of soft cheese and affettati, isn’t it? @eric: Maybe that’s what I get for eating gnocco fritto with a Veneta, then. (Although she called them crescentine.) I wish I remember where — a sort of divey place in the hills above Bologna where everyone was watching calcio. Excellent place, open-air. I will say that I appreciate the seasonal dining of most Italians. I had a Croat roommate who insisted on heating goulash in sweltering mid-Atlantic heat. That’s how they do it in the motherland, too: I’ll never forget rail-thin Macedonians wolfing down multiple courses of meat and potatoes during a summer seminar in Ohrid as I listlessly forced a few leaves of cold cabbage down. Ok, some old follow-up here: have you tired Hosteria Giusti in Modena, or would you? I haven’t and I don’t know about it. I’ll be in Modena in a few weeks time, should I try it? The house is in a little town just outside Modena called Santa Maria del Mugnano. Nobody lives there now because it has become a museum where you can also organize special events. Thank you so much. I will try to see it on GOOGLE EARTH. I did not mean to remain anonymous. I am Paul. I went to the house/museum not too long ago. It’s just south of Modena on a road called Stradello Nava. Here is a link to it on Google maps: http://goo.gl/maps/wD6Bh. You could take a taxi (it’s not that far from the city centre so don’t think it will cost you that much) or if you have a car you could drive. I will say that I appreciate the soanesal dining of most Italians. I had a Croat roommate who insisted on heating goulash in sweltering mid-Atlantic heat. That’s how they do it in the motherland, too: I’ll never forget rail-thin Macedonians wolfing down multiple courses of meat and potatoes during a summer seminar in Ohrid as I listlessly forced a few leaves of cold cabbage down. Numbers #10 and #11 are soooooo good! I love ’em. Great list once again Gattina. Yes, I just read on Yahoo news about Pavrarotti!! So, so sad. I too loved his voice, and will truly miss seenig him entertain us. The world has lost its songbird!! I recall a poem my mom told me when I was a litlte kid:I see that you smoke.I’ll warn you, I chew.If you won’t blow your smoke on me -I won’t spit on you.